This application is a Precision Wash Rinse Rinse Dry System for critical cleaning of medical components. It thoroughly processes a complete family of orthopedic implants that have been precision machined and polished with buffing compound. The system achieves very high cleanliness specifications in accordance with the manufacturers requirements. The line is constructed from two stainless steel modular MKD/T24 Console Systems and runs left to right. The consoles are built upon a heavy duty I beam fabricated base for accuracy, stability and ease of shipping and installation. PREWASH with Turbo/Filter and Surface Sweep – The first stage is designed to remove the bulk of the buffing compounds using a turbo system with large capacity filtration system. The highly effective turbo action reduces the gross soils (see below) prior to precision cleaning. 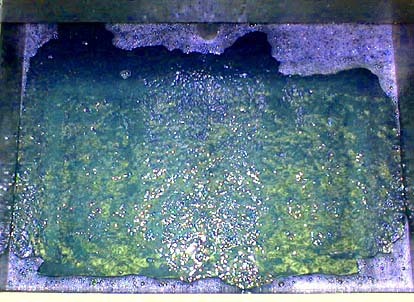 An OR6A oil removal system with SurfaceSweep is used to remove residual organic based deposits from the compound binders. ULTRASONIC WASH with Turbo/Filter and Surface Sweep – The second stage is designed to precision cleaning of the orthopedic implants. The precision wash uses ultrasonics combined with turbofilter. The powerful cleaning combination of the ultrasonics (seen below) alternating with the turbo (see above) greatly accelerates the cleaning process and yeilds superior results. 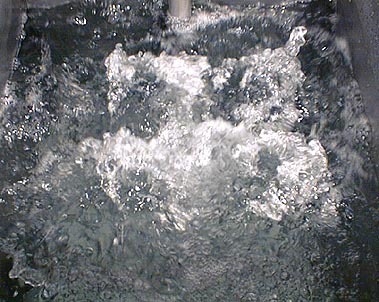 CASCADING RINSES – Two heated rinses uses with platform oscillation for the rinsing. The elevator moves the parts into solution and oscillates with either a short or long stroke. A two position switched is used to select either long 5 to 9 inch or short 2 to 4 inch strokes. The long stroke is used to provide better flushing (hydraulically forcing solution though the working zone) for nested masses of parts and/or complex shapes with recessed passages whereas the short stroke is used to provide quicker oscillations and faster cleaning of simple parts and/or part configurations. 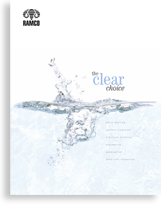 Flexibility in stroke ranges and speeds produce more comprehensive cleaning. HOT AIR KNIFE DRYING – The final stage of the process is the drying phase. 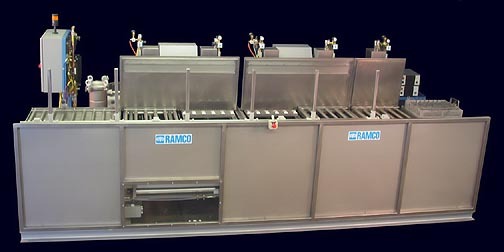 RAMCO Hot Air Knife Blow-Off Dryers are very effective for rapidly drying parts without using excessive heat. The key to the process is the process elevator. It is used to produce changing flow patterns that result in a dynamic drying mode (i.e. platform oscillation combined with hot air flow). The effect of “dynamic flow combination” is better coverage of component surfaces, maximum evaporation and accelerated processing times.